Phase Two of the Marvel Cinematic Universe kicked off last year with the blockbuster giant Iron Man 3, and after last winter's Thor: The Dark World, it's time for the very first of the Avengers to have his shot at a long awaited sequel. 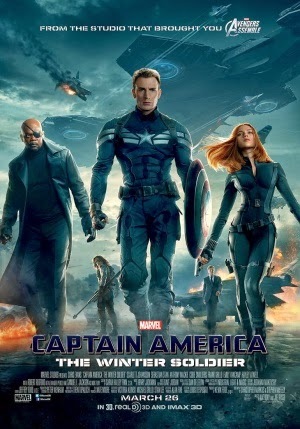 Captain America: The Winter Soldier takes place two years after Avengers Assemble, where Steve Rogers (Chris Evans) tries to adjust to modern society and continues his work for S.H.I.E.L.D alongside Nick Fury (Samuel L. Jackson) and Black Widow (Scarlett Johansson). S.H.I.E.L.D soon comes under threat and there is little security over whom to trust; especially when a superhuman assassin arises under the title of The Winter Soldier. While the past two instalments of this franchise have been nothing but bitter disappointments, Captain America: The Winter Soldier is an intelligent and gripping story from beginning to end that creates the best balance of humour and honest thrills since Avengers Assemble in 2012. A number of excellently choreographed set pieces inject tons of excitement into the overall plot, even if they sometimes go on for far too long. Perhaps the greatest aspect of the film is the sense of political fear as the protagonists cannot seem to trust anyone. Plot elements from The First Avenger and Avengers Assemble coincide here to create a fresh story that keeps us hooked the minute it begins. It's not without its flaws; some characters such as newcomer Falcon (Anthony Mackie) and even the titular villain are not as polished as they could've been, but this is fairly easy to overlook when the other central heroes and villains do so much to impress. Acting is top notch throughout, and Chris Evans is slowly proving himself to be the most impressive member of the Avengers lineup. He's a brutal badass but an honest and loyal hero, making him vastly likeable as he takes on a number of sinister baddies. Jackson performs as good as he always has in his role as Nick Fury, and a Johansson is surprisingly great with her role, thankfully making it more than unnecessary eye candy. Perhaps one of the most impressive performances is that of newcomer Robert Redford, whose role is a complex and highly interesting one. Overall with some superb action and a thoroughly engaging plot, The Winter Soldier is a welcome return to form for Marvel at the movies, and has rekindled my faith in this gargantuan superhero franchise.